From the Dashboard, the User can get acquainted with the basic reports on his own work schedule, create a request (application) for leave, sick leave, business trip or time off, change the interface settings (language, date/time format), and edit the location of the info panels. 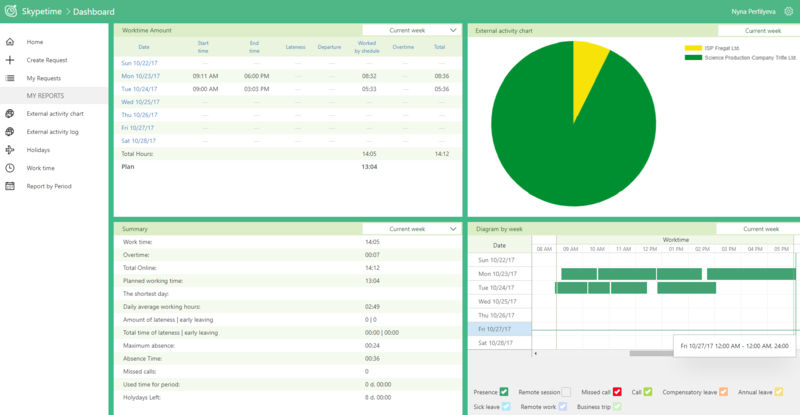 Four information panels display data on the working time for the current week in two forms: the Gantt chart and tables, applications for leave, the pie chart of external connections by providers. The location and selection of info panels in your account can be changed on the page “Edit dashboard”.